Team Sanya David Swete during the model boat racing in the Sanya race village of the Volvo Ocean Race 2011-12. Team Sanya David Swete, winner of the model boat racing in the Sanya race village, during the Volvo Ocean Race 2011-12. Team Sanya defeated other 5 teams from Volvo Ocean Race to win the Model Volvo Open 70 regatta at the Sanya Race Village on Tuesday, with CAMPER finishing second in the regatta. The one-meter scale models were sailed on water while representatives from the 6 teams controlled via wireless devices on shore. The Team Sanya model was crashed by that of Abu Dhabi Ocean Racing at the shakedown sailing, leaving its mast needing to be replaced. 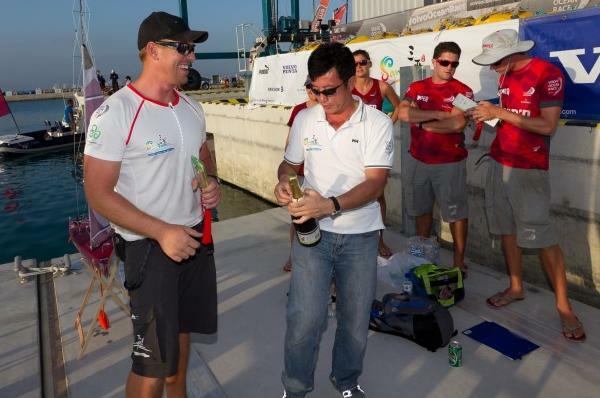 Much to the surprise of its home city’s spectators, Team Sanya seized the title without any suspense.